As Miss Winnie and Miss Naomi shared in their history written in 1985, there have been many changes and improvements at Covenant Mountain Mission. "Those of us who have been on the Covenant Mountain Mission staff almost from the beginning have seen great changes in the area brought about by electricity in rural communities, better roads, telephones, new schools, television and other modern conveniences. We feel that there has been much growth and progress in the work of the Covenant Mountain Mission and its outreach and the Word of the Lord has borne much fruit. To God be the Glory!" Their stories and pictures of the many modes of transportation that have been used since the beginning of the ministry are sure to bring a smile to your face. Gertrude Warner (later Johnson) and Viola Larson first traveled from Chicago, Illinois to Jonesville, Virginia in October of 1941. They named the 1931 Ford that conveyed them “Shasta” because ‘she hasta have tires, she hasta have a driver, and she hasta have gasoline.’ This car carried the women to Appalachia and then around to area schools and churches where they served. 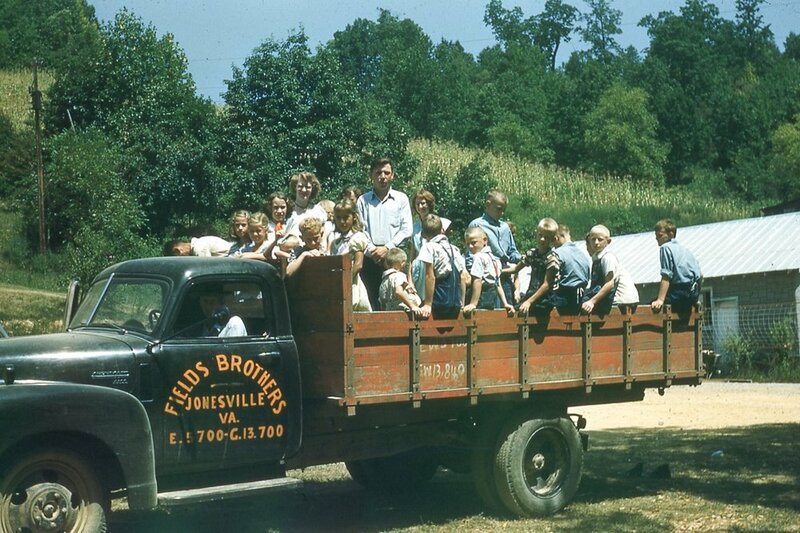 When the camp came into being and as the three churches grew, many folks did not have cars to transport their children to camp so the vehicles at hand were pressed into service. In the early years, Shasta of course was used. And, as expected, Miss Winnie and Miss Naomi’s later vehicles were also pressed into service to move campers to camp and home, as well as taking children to and from vacation bible school and church services. As seen in the following photos on several occasions, county school busses were also used to support the ministries. As resources allowed, both Wallens Creek and Mt. Washington Churches had busses to transport children to camp and to Sunday School and church. During the 65th reunion for the Mt. Washington Church and Covenant Mtn. Mission Bible Camp that was held in 2015, many people spoke of riding to Sunday School and camp in the back of trucks. The Fields Brother’s truck was used on more than one occasion. In later years a favorite of the children was Billie Lambert’s Chevy Truck.